If you have been reading the blog lately you know that I’ve been spending a bit of time at the beach where the temps are considerably warmer than those of the city in which I have for some unknown reason chosen to spend the last 35 years. Ok, I’ll admit there have been some very good reasons to reside in the far north but none of them include the weather during what is normally a long and unforgiving winter. Just like the shallow blog, my hometown has a mantra and, should you decide to visit during one of the six months of winter you will invariably hear someone reassure you that it’s a “dry cold” and the only thing you have to do to keep from freezing is “dress for it”. And dress for it we do with our hats and scarves and marshmallow down coats that make even a model figure appear somewhat rotund. Oh yes, and there are the boots. Never venture out into the icy winter without your boots lest you risk having your behind (or worse yet, your head) unceremoniously hit the pavement, or the even more horrific experience of being able to see but not feel any of your toes. Now let’s be honest. There’s no denying that not every day in my southern paradise is quite as toasty as I might like it to be. I do however have to give my head a shake when I overhear declarations about it being “freezing” outside as technically that would be 32 degrees fahrenheit and in reality the mercury seldom dips below 50. And I chuckle just a little when I picture these same people venturing out into the -30 celsius world that I have come to know all too well. Having said that, there have been times while walking on the beach that my ears start to tingle and the cool breezes cause me to reach into my bag and pull out the fleecie I brought with me, “just in case”. But it is far from frosty. Which brings me to what’s been bugging me just a tad, so I’ll explain. Understand please that one of the primary benefits of my journey to the south is the ability to rid myself of the bulky and less than flattering outerwear I am forced to don for the better part of 6 months. It’s the never ending “putting on and taking off “ that adds considerably to the time needed to journey out and I long for the days when I can step outside without the interminable search for the always misplaced left glove. So it is with some wonder that I question the clothing choices of my Southern California coastal neighbours. Make no mistake, I’m no fashionista although I do my best to keep up with the trends and will admit not only to owning four pairs of Toms but also to a new found passion for J.Crew cardis which I believe elevates me somewhere in the vicinity of Mrs. Obama. As a shallow person however, I do on occasion find myself critiquing the fashion choices of others and let me tell you, there’s plenty of room for that here. Because it appears that no one has figured out that down vests and sheepskin boots have no place on the beach. To be fair, I’m thinking I should forgive the down vest thing because they probably got carried away while in the Patagonia store picking up some vibram water shoes and simply couldn’t resist the array of colourful puffy things hanging on the rack. And once in a blue moon it does cool down enough at night to slip one over a long-sleeve Tee. But the woman wrapped in her sheepskin coat, wool scarf and knee high boots sporting a straw sun hat, well that is just wrong in so many ways. It’s the Uggs though that are truly bothersome. I simply can’t find any good reason for anyone, at any time, to think that there is one single justification for wearing Uggs on the beach. For those of you who are not as fashion forward as I am and may not be familiar with this product, Uggs are an Australian creation, apparently acquired by the Americans of late, that have taken the North American continent by storm. They are short and frumpy looking and do nothing to elongate the leg. Most importantly, and this detail is not to be missed, they are lined with sheepskin which, they tell me, makes them incredibly warm and cozy. And that’s what makes Uggs, if you insist on wearing them at all, perfect for the cold and snow. But the day the snow melts and the ice goes away is the day the Uggs come off. Period. If they were a fashion statement it would be “don’t wear us on the beach, and especially not with shorts or leggings”. And stop trying to convince me that they are great because they “breath”. Your feet breath too so why not let them revel in the warmth and comfort of the beautiful, soft sand. You see, I have a theory that the reason Uggs are so expensive for those of us who need them is that those of you who don’t are buying them all up thereby escalating the price. 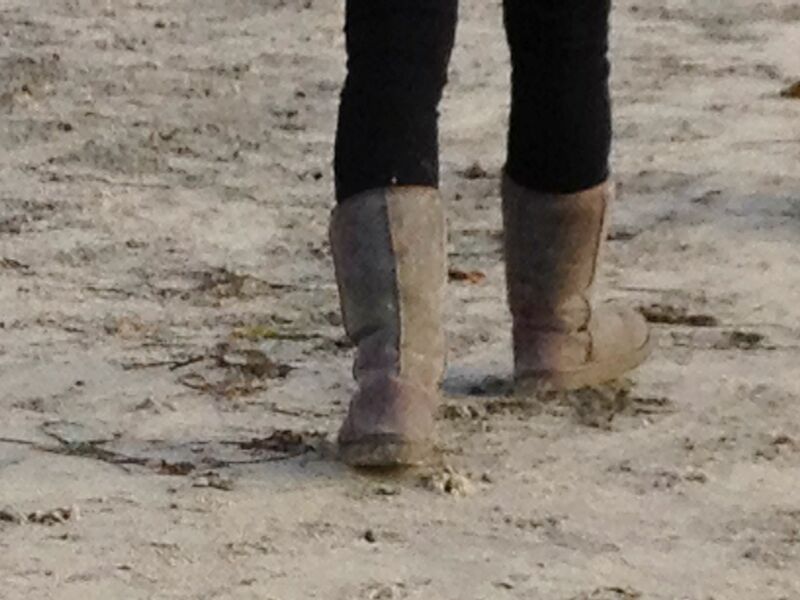 So I’m imploring you to give us northerners, and your feet, a break and stop wearing Uggs on the beach. Honestly, I’m not saying this just because it’s a cruel reminder of what we face upon our return home. For us its just as much a safety issue because without our boots we’ll be slip sliding all over the place . Trust me, even if you should be so unlucky as to accidently stumble and hit your head on the sand, it’s not going to hurt all that much. Guess what Wendy, I own a pair of Uggs. Hailey gave them to me for my birthday last year, and altho I have not worn them too often, they are comfortable, and you are correct in saying they are not to be worn on the beach. And guess what else, today is my birthday Feb.12th. I just noticed it is 12.58am, so I guess, yesterday was my birthday, and I had a lovely day. Hope your vacation is great, it sounds like you are having a good time. Regards to the handsome husband. xxoo D.
Glad to know you too have UGGS and apparently at this point I am the only person in the universe who doesn’t. Better run now, I’ve got some shopping to do.